The mechanisms responsible for restricted diffusion are incompletely understood and depend on the particular disease being considered. For many disorders several processes may act in concert to reduce the ADC. Increase in intracellular water. With cell death or insufficient intracellular energy metabolism, membrane pumps responsible for maintaining ionic gradients fail and swelling (cytotoxic edema) develops. Reduction in extracellular space. This occurs as a consequence of cellular swelling, resulting in increased tortuosity of extracellular pathways. Fragmentation of cellular components. With cell death or rupture, cellular components (membranes, mitochondria, endoplasmic reticulum, proteins, etc) dissociate, fragment, and unravel. Both intracellular and extracellular viscosity increases. The vast majority of neoplasms do not restrict diffusion or change it only mildly. A few interesting tumors, including lymphomas and some highly malignant gliomas, may show significant restriction of diffusion and thus appear remarkably bright on DW images. The ADC values of tumors is inversely correlated with cellularity. Cell walls form barriers to the diffusion of water molecule and so the more cells, the more barriers. If the packing density is very efficient, then the amount of extracellular space (where diffusion is normally freer) is also reduced. Uniform small round or hexagonal cells (as seen in lymphomas, medulloblastomas, and PNETs) pack more efficiently into the same volume than larger, irregular cells. So we would expect their ADC values to be correspondingly smaller. Bacterial abscesses and empyemas reliably demonstrate restricted diffusion, and DWI has proved useful in distinguishing abscesses from necrotic tumors, resolving hematomas, and other fluid-filled cavities. The restricted diffusion in abscesses is thought to be due to the presence of viscous fluid containing cellular debris, bacteria, inflammatory cells, and mucoid proteins. Animal models have shown an inverse correlation between cellular density and ADC. And from the Stokes-Einstein equations diffusivity is inversely proportional to viscosity. As treated abscesses mature, central liquifaction occurs and T2-"shine-through" gradually replaces the ADC-driven high signal on DW images. A wide range of toxic, metabolic, and demyelinating processes may result in restricted diffusion within the white matter. 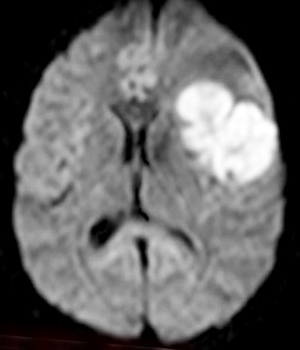 The high signal seen on DW images in these conditions may be fully reversible and does not necessarily imply cell death (as it does in infarction). 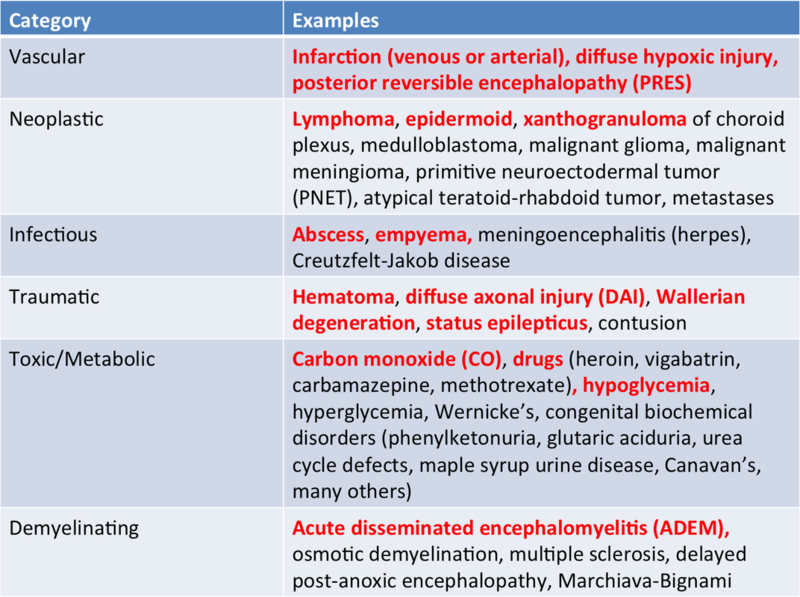 Diverse disorders such as hyperglycemia, osmotic demyelination syndrome, methotrexate encephalopathy, heroin toxicity, and phenylketonuria all share a final common pathway of brain injury, mediated by the release of excitotoxic amino acid neurotransmitters, especially glutamate. 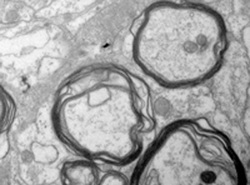 Excessive extracellular glutamate depolarizes adjacent injured neurons and glia. When glutamate binds to surface receptors it increases the flux of Na+ and Ca++ into cells, resulting in swelling and the initiation of apoptosis (programmed cell death). This becomes a vicious cycle resulting in the release of more glutamate with progressive cellular damage. 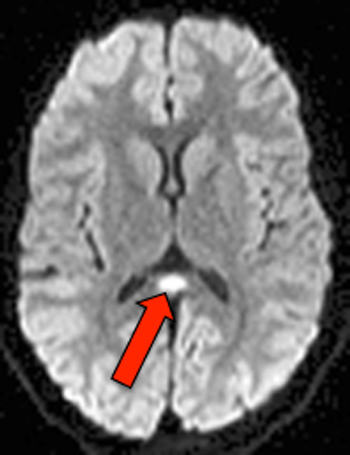 Fluid begins to collect between the layers of myelin in the axonal sheath, a phenomenon known as intramyelinic edema. The extracellular water in these myelin clefts is restricted in its movement and thought responsible for low white matter ADC values seen in these conditions. Burdette JH, Ricci PE, Pettiti N, Elster AD. Cerebral infarction: time course of signal changes on diffusion-weighted MR images in acute cerebral infarction. AJR Am J Roengenol 1998; 171:791-795. Haldorsen IS, Espland A, Larsson E-M. Central nervous system lymphoma: characteristic findings on traditional and advanced imaging. 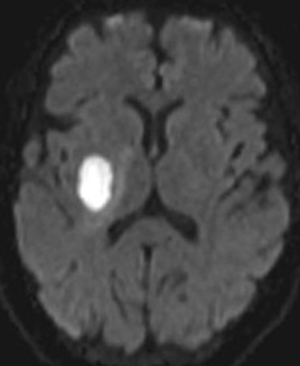 AJNR Am J Neuroradiol 2011; 32:984-992. Kono K, Inoue Y, Nakayama K, et al. The role of diffusion-weighted imaging in patients with brain tumors. AJNR Am J Neuroradiol 2001; 22:1081-1088. Moritani T, Smoker WRK, Sato Y, et al. Diffusion-weighted imaging of acute excitotoxic brain injury. 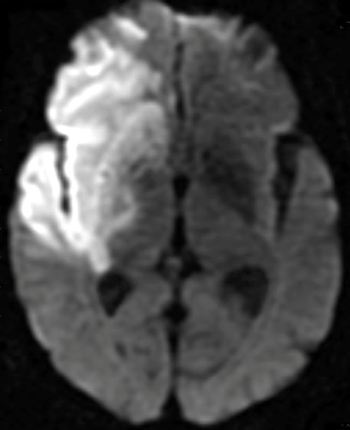 AJNR Am J Neuroradiol 2005; 26:216-228. Schaefer PW, Grant PE, Gonzalez RG. Diffusion-weighted MR imaging of the brain. Radiology 2000; 217:331-345.